I have a passion for capturing and expressing the real meaning of life events for people; even when they don’t know how to put it in words! I have always loved words, and writing. And all of my professional careers have been about making people’s lives better. I have been a nurse, a social worker, a psychotherapist, a founder of a national non-profit organization, and an award-winning writer. All of these experiences have helped to prepare me for connecting with people from many different social and cultural backgrounds to create a perfect ceremony for them. I am a Life Cycle Celebrant; a graduate and faculty member of the Celebrant Institute in New Jersey (www.celebrantinstitute.org). I can listen to what you are saying, both in your words and the meanings that are between and behind the words. Then, I can put that meaning on paper in a way that brings to life what is important to you. I love the challenge of getting it “just right” for each person and each situation! And I always treasure the trust that people give to me when they ask me to create a ceremony for their unique event. I have lived in New York and Wisconsin. Currently, I am loving the blue skies, warm temperatures, blue water, and the abundance of the arts on Florida’s west coast. I have been performing ceremonies in Florida for 15 years. And I play the oboe for the expression of my soul’s love for good music. 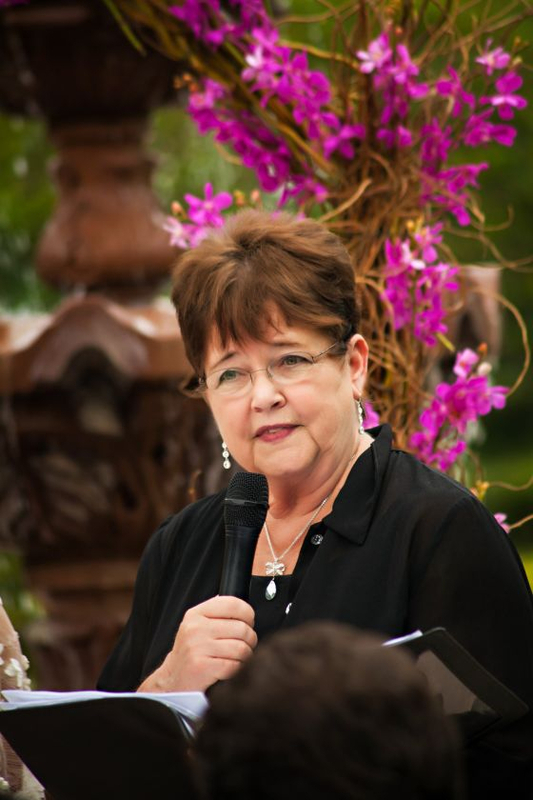 I will officiate your ceremony anywhere from Orlando to Tampa to Sarasota to Naples.